This in addition to the fact that the hill forms a part of the Baba Budangiri range, which is turn is considered to be the holy place of Guru Dattatreya, gives a spiritual appeal to the mountain. The easy to moderate difficulty level of trek ensures that people with little or even no trekking experience can complete it in a relatively effortless manner. 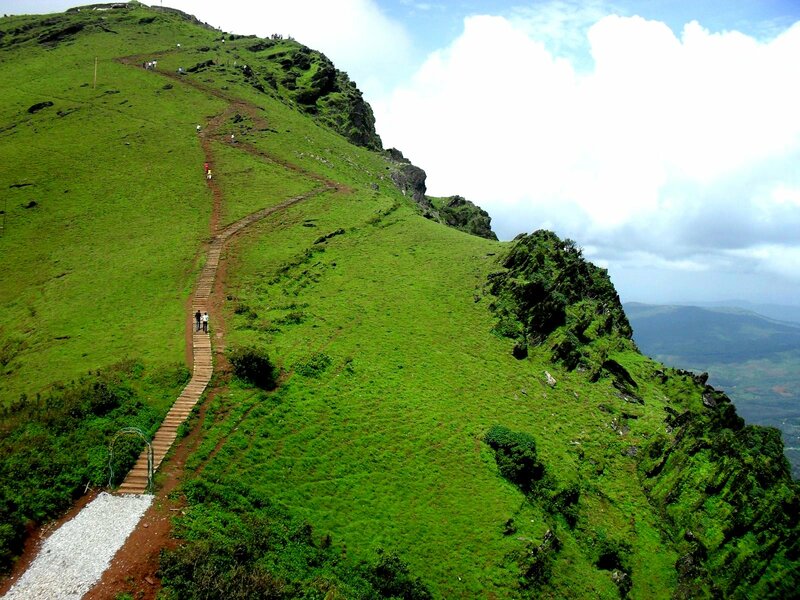 The lush green surroundings and the soothing environments add to the appeal and excitement of the trek and motivate the participants to reach the peak at the earliest.One can see a whole range of Western Ghats from the Shiva temple on the hill top. One has to be really lucky to catch a glimpse of the enchanting sunrise from atop the magical hills. The route we take will comprise of steep inclinations, breathtaking cliffs, deep green virgin forests and a peaceful home-stay nested in the forest. The biggest reward for the trekkers awaits them at the summit, where the sight of the beauty surrounding them often leaves them dumbfounded and floored. Most participants come back from the trek feeling totally taken back by their encounters with the diverse treasures that nature has blessed Mother Earth with. 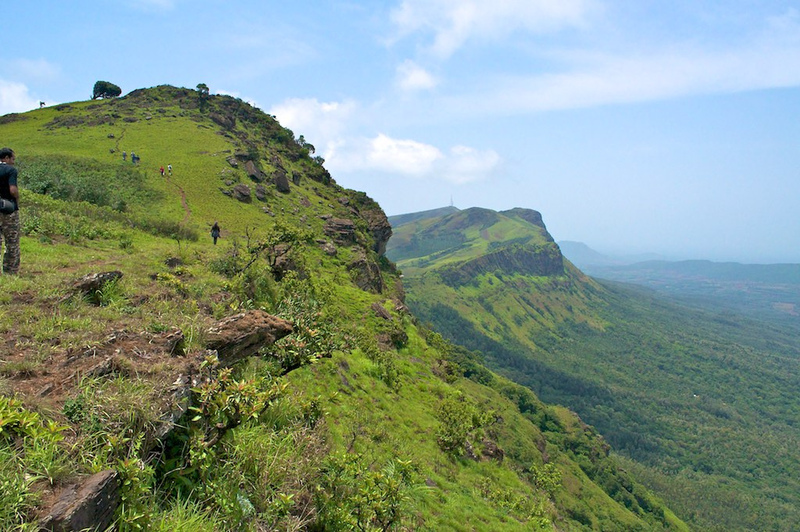 The best time to undertake the Mullayanagiri trek is during the months of September to February. During this time the weather is perfect to enjoy the walk up the mountain and the beauty of the region is at its peak. The trekkers get to enjoy some of the most amazing sights of extremely rare flora and fauna. The trail becomes extremely slippery and crowded with leeches during the monsoon season, which is why it is best to avoid trekking in the region during that time. Route - From Chikmagalur proceed towards Bababudangiri, near Kaimara you have to take left turn (8 kms from Chikmagalur). You will hit Y intersection, Your left side road goes to mullayanagiri peak(direct road till peak ). If you want to trek then just move straight further 500 mts. You will find small arch towards your left. That is called Sarpadhari. This will be your starting point. The trail starts from Sarpadhari which in Kannada means serpentine path. At times this stretch has an inclination upto 60 degrees. The initial trail being steep, offers great opportunity to overcome fear of heights for the uninitiated. And for those who want to get beyond the limits of height, this is just for them. The beauty of this trek lies in the natural phenomenon wherein mist sweeps in at times without any notice at such a low altitude. One continues to climb uphill with small breaks in between until Mullayangiri top is reached. The inclination suddenly increases once the temple flag gets visible. From Sarphdhari till Mullayangiri peak the trek distance is 3 kms. 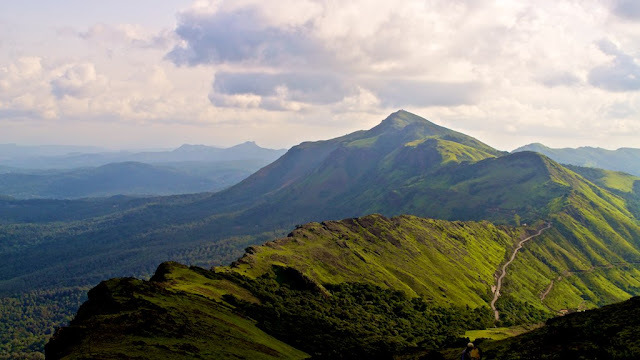 The peak offers a panoramic view of the Western Ghats and the beautiful coffee estates of Chikmagalur. The Mullayangiri Peak is connected by road on one end which is further connected to the stretched meadows in all directions. Here, one can take rest for some time, and visit the temple. The view from the temple towards Bababudangiri is breath taking. This is the highest point in Karnataka! This view of the Western Ghats from here can’t be captured in one lens. Start the descent from the rear end of the temple towards the rolling grassland with few steep inclinations. A helping hand will make the descent more comfortable. On the way one will see “The Peace Tree” . Spending sometime here with detached mind is cherishing and awakening. Here on,route diverges in two, one going towards the check post and other towards our home-stay. The home-stay is 6 kms away from Mullayangiri Peak. The home-stay is located in between the mighty Mullayangiri and Bababudangiri. 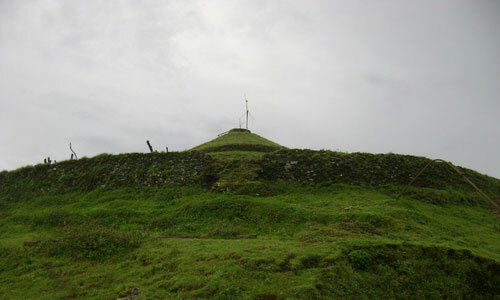 Bababudangiri is sacred for both the Hindus and Muslims. To reach Bababudangiri one follows a moderate ascent. From one side of the peak the ridge line towards Mullayangiri can be seen until till the BSNL tower. On the other end, a small town of Bababudangiri is followed by lush green forest area spreading over thousands of acres. The climax of whole trek is the ridge walk. From Bababudangiri one reaches the BSNL towers and starts walking on the sides towards the ridge. This ridge is also known as the Blade Ridge. The ridge now touches a police chowki on the curvy roads that joins Chikmagalur and Bababudangiri. It takes 3 hours for an average trekker to reach the ridge starting point from BSNL tower. "PEAK OF MULLYANGIRI AND BABAUDEN GIRI ALONG THE STRETCH"